Realize that what you feed your body, is what’s absorbed by the brain from the benefits of the nutrients that’s consumed. Although that might sound a tad trite, it’s an extremely simple yet powerful concept when it comes to a healthy diet. Our brains are helpless on what we eat, as it depends solely on the nutrients that are provided. So a balanced diet, extends far beyond fueling all the other organs in the body for it to function optimally. What this “function” involves is properly managing our emotions along with certain mood disorders. One of the key basics of maintaining mental health, involves a healthy nutritional eating plan. What this involves is making sure that you have three balanced meals a day, all comprised of healthy foods, which includes the basic food groups such as lean protein, fruits and vegetables, grains, and managed amounts of low fat dairy and fats. Eating well-balanced healthy meals is the start of properly caring for yourself, one that makes the biggest difference when it comes to your mental health. This is something that you have complete control over, something that you can begin immediately. What’s common because of our hectic fast-forward lifestyle, is routinely skipping meals or eating poor convenient foods, where the result is they’ll make you feel irritable, fatigued, and moody. It only makes sense, and in your best interest to properly nourish your brain in the most beneficial way possible. What results is you’ll begin to feel better, lighter, have more energy to do the things that you want to. What’s known is that eating well becomes a burden, this especially when you’re too busy, or feeling irritable, this whether it’s depression or bipolar. What goes missing is your appetite, the willingness to eat even if you’re stomach is empty, as the need to refuel yourself disappears. The will to eat anything, let alone anything nutritional becomes difficult. Eating your favorite foods or having a nice meal, no longer brings the same pleasure that it once did. You might also become too fatigued to go grocery shopping or cook, as eating becomes a major struggle in your life, turning into a disorder. Then you turn to skipping meals or choosing to feed on take out or fast food, which becomes habitual, an easy choice because of simplicity. During these times, you need to remind yourself that this behavior isn’t healthy for your body, and especially your brain. You need to constantly feed yourself the essential nutrients from a healthy diet, this to function at your peak. This especially becomes important once you’re dealing with disorders such as moodiness and anxiety. The key becomes how you can begin. The best way it’s found is to plan ahead, lay out a road map for the day and week. Begin by making a grocery list of nutrient rich foods, and then cook healthy meals, making it part of your routine. Make a schedule and make sure you follow through, even if you don’t feel like it. What’s found helpful is cooking larger batches of food on the weekends, or whenever you have the time to do so. Cook foods which can be stored such as a wholesome batch of stew, a large pot roast, or an oven roasted chicken. Freeze individual portions for later on in the week, or for those hectic days when you don’t have time for cooking. The summer obviously makes it easier, this because there’s more fresh food choices that are immediately available, which smells and tastes better, which acts as an incentive to satisfy your appetite. What all the instant fresh nutrients does is eases the cooking process, as grocery stores, farmers markets, or your garden, offers an abundance of local produce which is tempting and delicious to eat. 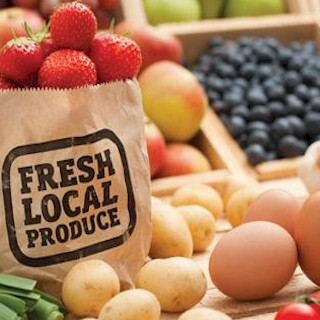 So make it a point to venture out and visit the produce stands, which offers freshly picked local fruits and vegetables. Realize some stands are seasonal or open just one day a week, so make sure you check what’s available in your neighborhood. Local tomatoes, berries, and apples always tastes better fresh and direct from the farm, as do vegetables such as cucumbers, lettuce, squash, corn on the cob, or zucchini. Late summer and the fall is the most opportune time for these natural nutrients. So take advantage of the fresh produce which is locally available in your area, along with becoming creative with your daily meals by planning ahead, will set you towards eating as healthy as possible. If you find it difficult or can’t decide what to cook, then aim for different colored foods such as the yellows, reds, and greens on your plate. Prepare fresh salads then add low-calorie vinaigrette dressing, or quickly stirfry fresh vegetables with broiled or grilled chicken, lean beef, or fish for dinner. What’s convenient is having an outdoor grill when the weather is warm, but you can get the same effect using your stove top grill or your broiler. Add nutritional berries or a banana to your morning cereal or yogurt. Make it a habit of snacking on a piece of fresh fruit or carrot sticks, instead of eating convenient unhealthy junk food in the afternoon. Savor all of the flavors that are available this time of year. Fresh and natural always tastes much better than the “hothouse” variety of produce, which has been picked prematurely, shipped for two weeks across the country, to your grocers shelves. Enjoying fresh foods is one of the benefits of summer, which is guaranteed to take you out of the doldrums, while feeding your brain.